With all of the modern toys available for children today, handmade custom built toys especially for the little ones in your life are sure to be something that will always be treasured. Our collection of toy plans allows you to create one-of-a-kind toys perfect for the children in your life. From doll furniture to darling wooden rocking horses, these projects will be a fun and fantastic way to show your love for that special child in your life. 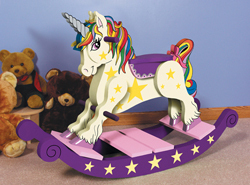 Our collection of toy plans includes many fun things for your child to cherish for years to come. We offer detailed blueprints so you can easily follow the instructions and then personalize your creation for that special someone. With a wide variety of plans, we are sure that you will find the perfect do-it-yourself project to fit your needs.